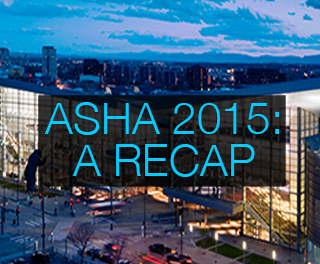 Wow - it's hard to believe another amazing ASHA Convention is in the books! 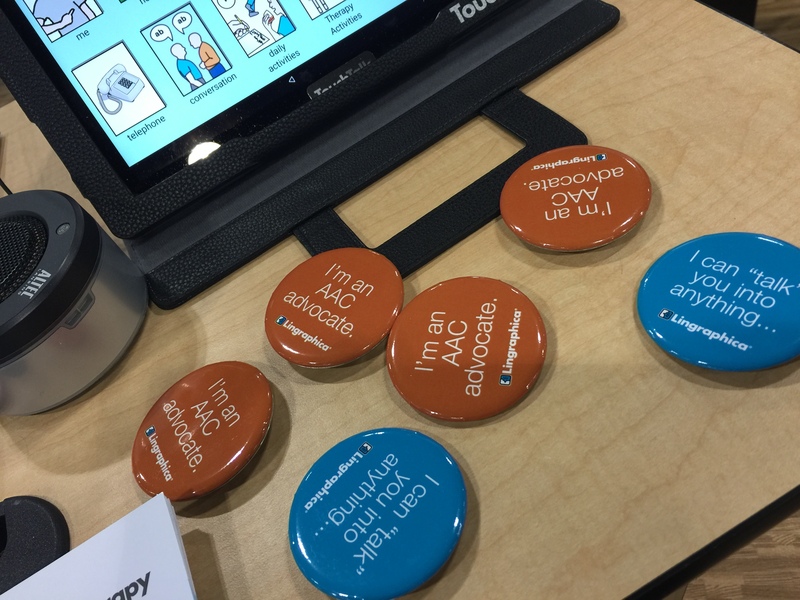 The Mile High City was packed with 14,008 speech-language pathologists (SLPs), audiologists, clinicians, and other speech professionals for five days, and the energy was truly unlimited. Here are some of the highlights. We kicked off the convention at the AphasiaAccess breakfast on Thursday morning. Our Clinical Consultant, Brianne Kosch, MA, CCC-SLP, hosted a conversation about incorporating students and volunteers into aphasia centers. Brianne shared her own experience cruising with the Aphasia Recovery Connection group earlier this year, and highlighted Lingraphica's outcome study with the SCALE aphasia center in Baltimore which relied on two graduate students to help. She also noted different ways for aphasia centers, groups, and SLPs to raise awareness of the condition that affects almost two million Americans. The room of 100 clinicians and aphasia advocates cheered when Brianne and her table suggested a national walk to recognize aphasia. After the breakfast we hit the tradeshow floor to meet SLPs. Hundreds of SLPs stopped by our booth and connected with our clinical team to learn about our research-backed communication devices, therapy and language apps, online speech services, and specialized news sources: TalkPath News. Our team was able to provide hands-on demonstrations of all of our products and offerings. We always love seeing the SLPs we work with in person! We attended numerous captivating posters and presentations during the convention. Of the many presentations we attended, we especially loved, "Hear Us Roar: Aphasia Advocacy & Awareness Across Different Stages & Settings" presented by several directors of aphasia centers and aphasia advocacy groups. The group shared various examples of advocacy and awareness efforts that work to increase knowledge of the common communication disorder. It's always good to see our peers and friends in the aphasia field. Plus, our team had several posters and presentations at this year's show. Lisa Haynes, MS, CCC-SLP, and Leland Wheeler, MA, CCC-SLP, shared how to build a functional maintenance program (FMP) that follows the Life Participation Approach to Aphasia (LPAA) model. Lisa and Leland used their original research to show how an FMP can assist aphasia patients living in a long-term care facility. You can hear about their poster on Lingraphica's Blog Talk Radio show here. Dr. Richard Steele also shared his research that demonstrates how combining teletherapy and online exercises improves outcomes and increases engagement at an aphasia centers that embraces the LPAA model. You can hear more about his sessions on Blog Talk Radio here. 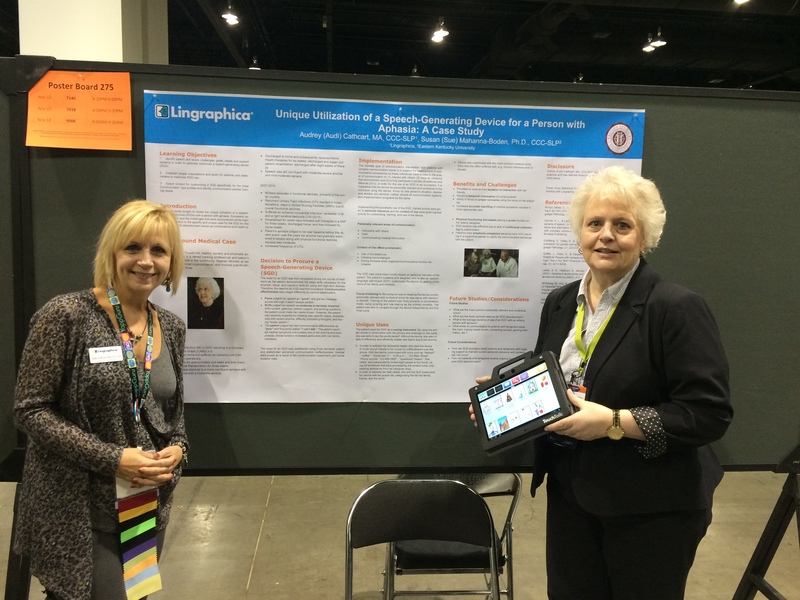 Finally, our Clinical Consultant, Audi Cathcart, MA, CCC-SLP and her colleague, Susan Mahanna-Boden, PhD, shared a case study that demonstrated the effectiveness of a speech-generating devices for an adult with aphasia. These ladies know how to have fun! 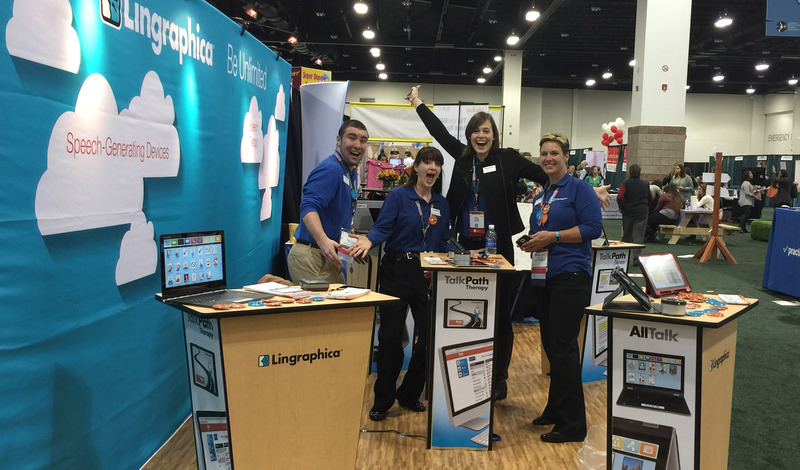 Booth #332 was full of energy Thursday, Friday, and Saturday. Our entire clinical team was present at the show, and attendees loved it. 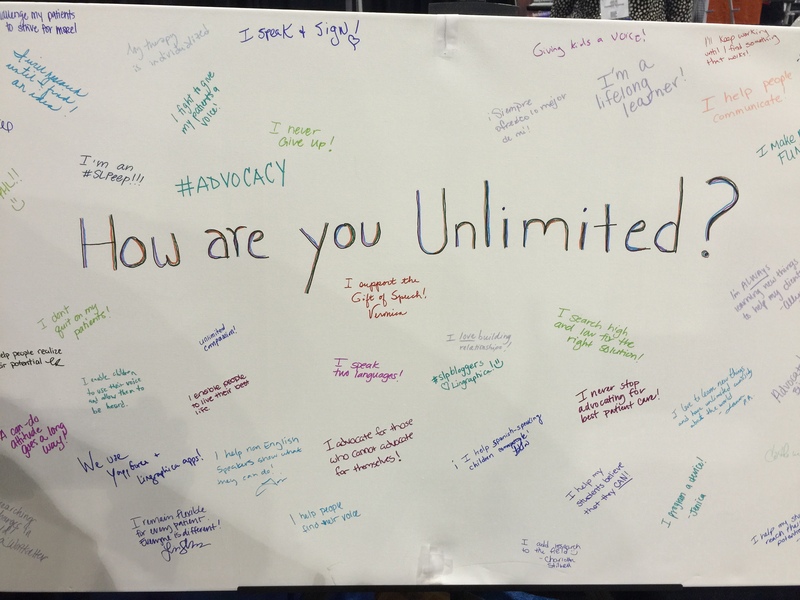 Throughout the show we asked attendees what makes them unlimited in their practice. A large white canvas, located at the edge of our booth, collected hundreds of hand-written sayings about ways SLPs are unlimited. Some of the responses included, "I advocate for my clients," and "I never give up." One thing is for sure, SLPs love their clients! We gave away hundreds of pins, a GoPro, and tons of tips for clinicians looking for free resources. YappGuru also stopped by our booth on Friday to share their website. You can read more about our partnership with YappGuru here. This show always invigorates and inspires our team to do great things. We love sharing our offerings with SLPs and finding solutions that help them help their clients. If you have any ideas, feedback, or a special memory from ASHA, please share them with our team.